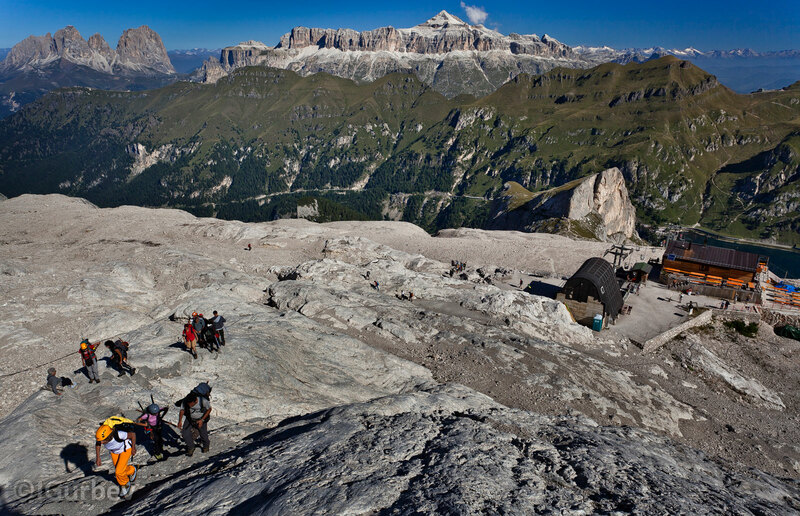 Punta Penia is the highest peak in Marmolada and Dolomiti. The common climbing is from North, Passo Fedoia (a bit more than 2000 m.) and then with the lift which goes up to 2600 m.
We walked up the glacier and the last sector we climbed a ferrata . 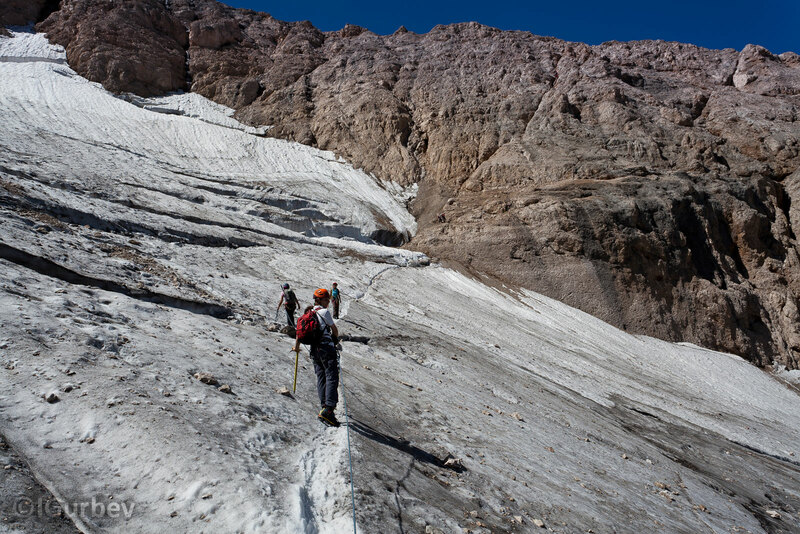 At this time of the year (the end of August) the snow melt was progressing and climbing the glacier wasn't easy at all. 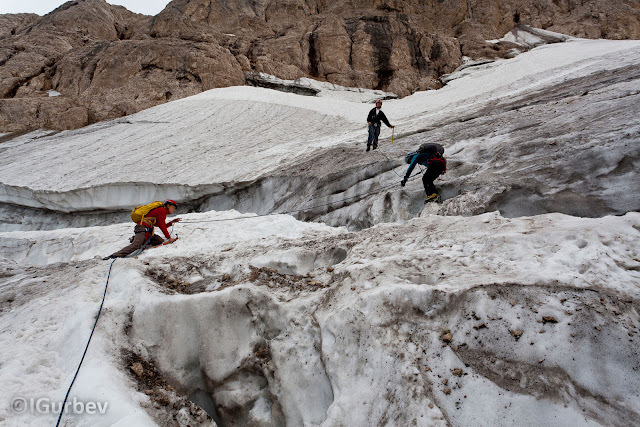 Hacking the polished ice at the beginning of the glacier was a terrifying thing to do for our group. Jumping over the crevices was quite scary also, but all this was nothing comparing to the main оbstructions. 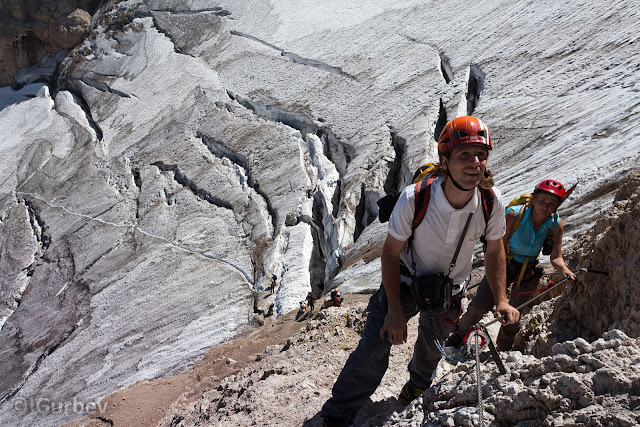 The second major difficulty was the place between the glacier and the ferrata. There was a one meter or even more big crevice and the wall of the ferrata was a few meters high plumb and the only possibility to hold was a tied rope thick as a shoelace. We had to drop a rope for assurance. Here we are at the start of the ferrata. On the bottom of the photo you can see the crowding on this difficult part, where on our way back we had to wait and therefore missed the lift.